After a busy week of shopping last week I decided to postpone my weekly Publix trip from Thursday until over the weekend. My grandparents were in town for the weekend so I never quite made it there until today. I am kind of glad I didn't go over the weekend because Justin and I finally got into a produce delivery/CSA type program so we really don't need to stock up on produce much anymore. We are giving Affordable Organics a try this week and if we like it we are planning to sign up for an every other week full share of produce. It's $45 every two weeks but given what we will be getting I think it is a great way to spend part of our two week grocery budget. Today's Publix trip was mostly dairy, eggs, and pantry items (and bacon!). We are eating down the meat freezer again in anticipation of our forty pounds of Zaycon chicken arriving in October and of the turkey and ham sales that the holidays are sure to bring. I did two transactions so I could use two $5/$30 Winn Dixie coupons and I was thrilled to find tons of in store blinkie coupons and booklets. I actually had a $25 gift card to put towards what ended up being $27 out of pocket which means that we only really spent $2 today which makes paying for our first organic produce share tomorrow that much more affordable. 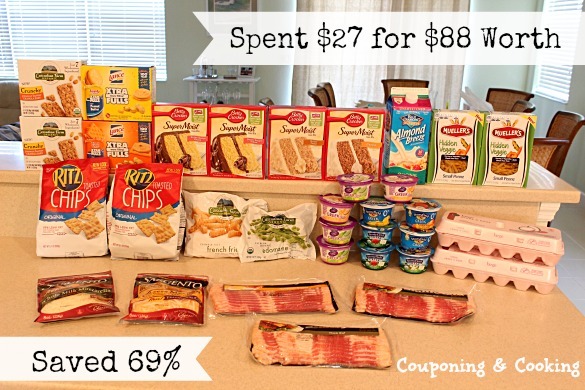 Make sure to come back later this week for my Weekly Shopping Totals link up! Be sure to enter my two amazing giveaways going on right now too.